Located on National Highway 1A, the Bau Truc Pottery Village in Ninh Phuoc district is famous for ceramics made from clay from the Quao River. “Villagers take the soft clay and mix it with sand to create a base material,” Gach said. “These techniques have been passed down from generation to generation." Cham pots are shaped by hand and are not made on a rotating electric wheel. The pots are dried under the sun for four to six hours before being fired outdoors over straw or wood. The entire process, from beginning to end, is done by hand: from drying and soaking the materials in water to mixing sand and kneading the clay, to decorating the pots before firing. Simple tools like anvils, moulds and wet cloths are also used. The patterns on the pots, which are freely decorated, often depict tree branches or shells, made with traditional techniques that colour the pottery in old, mysterious styles, according to Gach. Images of snails or paintings featuring the daily life of Bau Truc Village’s people are often used for decoration as well. Because the potters do not use kilns, their handmade jars are especially good for keeping water cool. Pots from the village have natural colours: varying from reddish-brown, pink-red and dark gray with brown streaks, which are all characteristic of Chăm culture. Upon entering the village gate, visitors can see pottery lining the streets and in front of houses, and can stop to learn techniques at workshops and take home their handmade items. The village’s most popular items are reliefs featuring Cham women, kings or dancers, and products for spiritual worship or everyday household utensils. Jars, decorative lamps, reliefs, and statuettes of Apsara (female dancers) and Shiva, one of the three main gods in Hinduism, are also sold at the village. The village, which has existed since the reign of Cham King Po Klong Garai (1151-1205), holds a ceremony every year to honour Po Klong Chan, the founder of the village. Today, however, Bau Truc potters are trying desperately to survive. Some 85 percent of the total 400 households in the village earn their living from making pottery. However, the villagers fear they will have to stop working as potters because of the unstable output, low income, and lack of interest from traders. 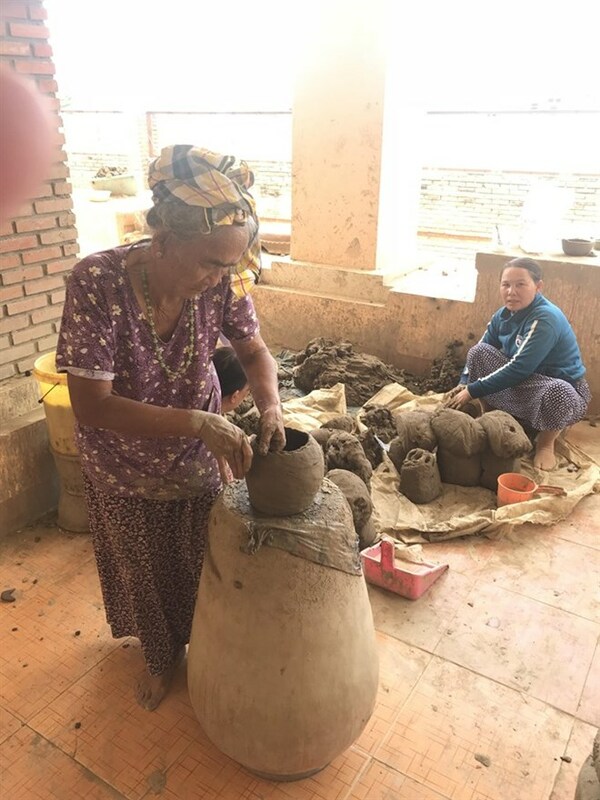 Though the village has a variety of works in different sizes and colours, as well as fine art works and souvenirs, they have to compete with other craft villages with a long storied history, according to Phu Huu Minh Thuan, Director of the Bau Truc Pottery Village Cooperative. Many products have simple designs that cannot match the variety and modern style of ceramics made by the famous Bat Trang Pottery and Binh Duong Pottery villages. “Our monthly production is about 1,000 items, a small number compared with Bat Trang or Binh Duong,” Thuan said. The artisans’ income is only around 2.5 million VND (110 USD) per month. “That’s why many households no longer make pottery, even though they still love the traditional work. They have to look for other jobs with better earnings,” Thuan said. To save the village’s craft, Thuan has recommended several solutions to provincial authorities, including financial support to register an official village trademark, and more trade promotions at seminars and conferences. Ninh Thuan authorities are also planning to compile a dossier on Cham pottery in a bid to earn UNESCO cultural heritage recognition. 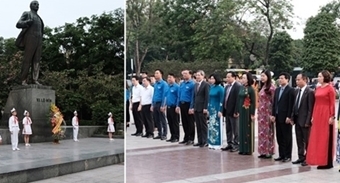 However, the provincial authorities urgently need support from government agencies, especially the Ministry of Culture, Sports and Tourism and the Vietnam National Institute of Culture and Arts Studies in HCM City, according to Thuan. In 2017, the pottery made in Bau Truc Village in Ninh Thuan was recognised as a national intangible cultural heritage by the Ministry of Culture, Sports and Tourism.